I love crafts that are super simple and take just minutes to make. That's why I had to share this fuzzy acorn tutorial that uses just a few simple materials and a hot glue gun. Can you say "autumn"? As you know, with the family so busy, I rarely have time to craft. I love that this idea took no skill, just a little time. You can even have older kids help! Now, you can create a very simple burlap envelope by folding in the corners of the burlap square so that they overlap slightly in the middle. Secure the bottom three corners in place by gluing them together. Take the top corner, making sure it comes down to overlap the bottom corner by at least 1 inch, and glue a wooden bead in place near the corner. Now, to the bottom flap, affix a simple "loop" made from pipe cleaner with your hot glue.. When everything has cooled, fill the envelope with the acorns, and close the envelope by hooking the bead through the loop you created. 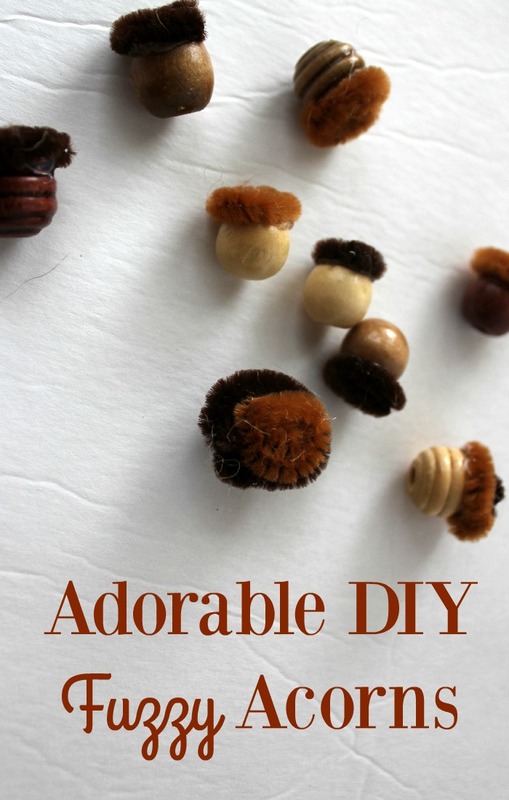 This craft is not only simple, but it's affordable, too! What fall or Halloween crafts do you have on your to-do list this season?